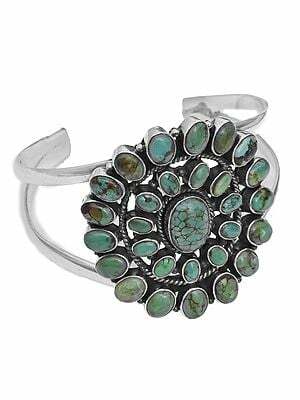 The history of turquoise jewelry dates back all the way to ancient Turkistan and regions of Caucasus in the 3rd century A.D., and is thus more commonly known as "Persian Turquoise". This name also applies to those gems mined in the United States, as long as they have no traces of brown or black veining on them. Because turquoise is a hydrous phosphate of copper, it's actually is very soft - topping 6 on Mohs scale - yet it still can take a good polishing. Turquoise jewelry in the United States does indeed have very deeps roots within the natives' jewelry traditions, despite the fact that it is currently being mined all around the world. In America, the only states that export turquoise gemstones are Nevada, Colorado, Arizona and New Mexico. In case you're not familiar with these states, they all have quite large regions of desert, and this is where the turquoise is mostly found. Other major worldwide locations include Afghanistan and Australia, while the USA still remains as the major producer of these fine and precious stones. In Europe, the first signs of imported turquoise can be traced to the mines in Egypt of Iran. Even today, the world's finest and purest turquoise comes from Iran, from the mines of Nishapur to be more exact, and it's considered a great trade and bartering item since the times of the easily Persians. One of the reasons turquoise made it so big of a success in the Asian countries has most likely something to do with its greenish tint of cyan, and the fact that Asians consider blue a color of luck. Many blue gems and jewels are also believed to contain special powers, for example to bless a journey or to protect a pilgrimage from any kind of harm. But while turquoise has played its part in decorations and amulets, it has also been used by Aztec kings to make out masks, knives and shields, which obviously have been meant for something else than be used for peaceful means. Native tribes in the USA also believed that a turquoise amulet gives soldiers more strength, swiftness or a better aim for the archers, so they also used the stones in beads, mosaics and carvings of all types. Later on jewelry made way to silver that was introduced to the natives by white man.